President Muhammadu Buhari Monday in Abuja signed an Executive Order to enhance local content in public procurement. The order, according to his media aide, Mallam Garba Shehu, which consists of science, engineering and technology components, is expected to promote the application of science, technology and innovation towards achieving the nation’s development goals across all sectors of the economy. The statement said the president, pursuant to the authority vested in him by the Constitution, ordered that all “procuring authorities shall give preference to Nigerian companies and firms in the award of contracts, in line with the Public Procurement Act 2007”. The Executive Order also prohibits the Ministry of Interior from issuing visas to foreign workers whose skills are readily available in Nigeria, adding that where expertise is lacking, procuring entities will give preference to foreign companies and firms with a demonstrable and verifiable plan for indigenous development, prior to the award of such contracts. 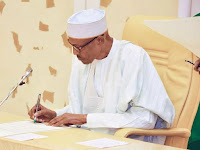 The statement added that in the order titled: “Presidential Executive Order Five for Planning and Execution of Projects, Promotion of Nigerian Content in Contracts and Science, Engineering and Technology,” the president has directed ministries, departments and agencies (MDAs) to engage indigenous professionals in the planning, design and execution of national security projects. The president also signed the Instruments of Ratification of the Bilateral Air Services Agreements between the Government of the Federal Republic of Nigeria and the Governments of the People’s Democratic Republic of Algeria, the Republic of Congo, the People’s Republic of China, the State of Qatar, and the Republic of Singapore. In another statement, Shehu said the execution of the instruments was expected to link Nigeria’s aviation with the respective countries and consequently improve significantly flight operations to and from the countries.